Our elementary students spend their year in two primary ways. The first is our Shoreshim, or roots days. These days are meant to build strong knowledge about, and connections to, Judaism, while building community and friendships. Each week students receive both core and flex scheduling. Students experiences core, grade level curriculum through hands-on, tactile and creative settings. In their flex scheduling, all grades experience music, art, Jewish Makerspace, modern Hebrew, prayer skills and Israel, and elective based learning in creative and experiential ways. This model allows us to cover a vast amount of material in just a few hours a week, while striving to allow every learner to access creative avenues to learning. 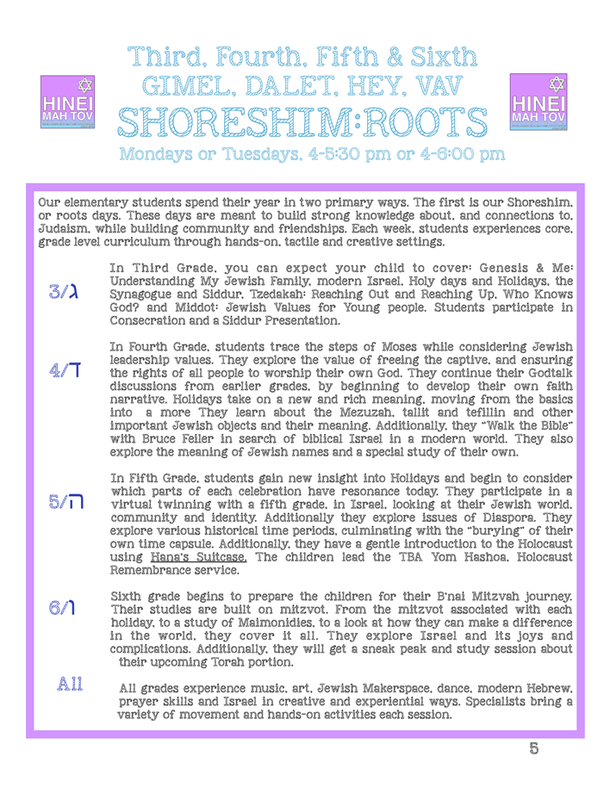 In Third Grade, you can expect your child to cover: Genesis & Me: Understanding My Jewish Family, modern Israel, Holy days and Holidays, the Synagogue and Siddur, Tzedakah: Reaching Out and Reaching Up, Who Knows God? and Middot: Jewish Values for Young people. Students participate in Consecration and a Siddur Presentation. In Fourth Grade, students trace the steps of Moses while considering Jewish leadership values. They explore the value of freeing the captive, and ensuring the rights of all people to worship their own God. They continue their Godtalk discussions from earlier grades, by beginning to develop their own faith narrative. Holidays take on a new and rich meaning, moving from the basics into a more they learn about the Mezuzah, tallit and tefillin and other important Jewish objects and their meaning. Additionally, they “Walk the Bible” with Bruce Feiler in search of biblical Israel in a modern world. They also explore the meaning of Jewish names and a special study of their own. Sixth grade begins to prepare the children for their B’nai Mitzvah journey. 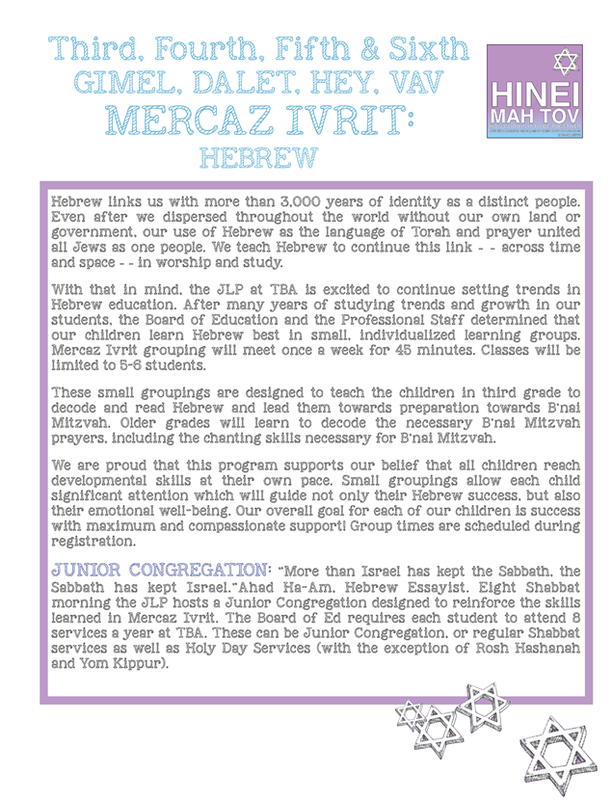 Their studies are built on mitzvot. 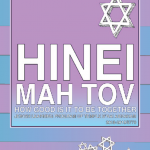 From the mitzvot associated with each holiday, to a study of Maimonidies, to a look at how they can make a difference in the world, they cover it all. They explore Israel and its joys and complications. Additionally, they will get a sneak peak and study session about their upcoming Torah portion. All grades experience music, art, Jewish Makerspace, dance, modern Hebrew, prayer skills and Israel in creative and experiential ways. Specialists bring a variety of movement and hands-on activities each session.